German Design Award 2019: Winner of the Excellent Communications Design category. We’re excited to announce that VirtualSpeech have been selected as the German Design Award 2019 winner in the category for Excellent Communications Design. The annual German Design Award is one of the most prestigious design competitions in the world and organised by the leading authority on design in Germany - the German Design Council. The jury of the German Design Award is chaired by some of the most praised and acclaimed specialists, businesspeople and brand directors in fields of industry, marketing and design. Prizes are awarded to projects that truly represent pioneering contributions to the German and international design landscape, with the highly-esteemed, international judging panel ensuring this. The German Design Award identifies and presents unique design trends and is a competition that advances the design-oriented scene. 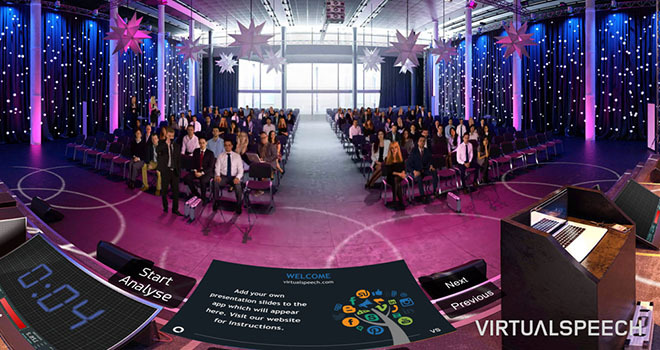 VirtualSpeech combine traditional e-learning and in-person training with virtual reality. This allows participants to practice the skills they learn in realistic virtual environments, from speaking at a conference to dealing with hostile journalists. VirtualSpeech offer e-learning courses for individuals and employees, as well as specific tools for trainers to enhance their in-person training sessions. VirtualSpeech have worked with companies and universities around the world, including organisations such as Wilhelmsen and Accenture, and have authored several industry leading white papers on VR training for soft skills. What’s special about the VirtualSpeech is that it conveys topics being learned online in a virtual classroom that is nonetheless highly realistic. An approach to learning that’s extremely interesting and promising.